D4 offers a level of speed and accuracy that will redefine your notion of the fleeting moment. 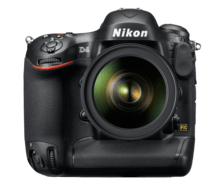 A carefully selected FX-format 16.2 Megapixel CMOS sensor is paired with Nikon’s powerful EXPEED3 image processor for stunning stills up to 11 fps. A 91,000-Pixel RGB 3D Color Matrix Metering III sensor partners with Nikon’s Advanced SRS to deliver unmatched accuracy in every frame. Add a faster, more responsive 51-point AF system for a camera that can keep pace with you. What are speed and accuracy without image quality? Nikon’s FX-format (36.0mm x 23.9mm) CMOS image sensor delivers 16.2 effective megapixels of resolution for exquisite detail. Each of this remarkable sensor’s 7.3-micron pixels is designed to collect maximum light to produce stunning images and video across D4’s broad ISO range of 100 to 12,800 (expandable down to 50 and up to 204,800). Expect the highest image quality in bright and dark shooting. Plus, EXPEED3 image processing yields the most faithful colors, tones and a wide dynamic range. When an assignment calls for broadcast-quality video and audio, D4 is ready. Choose from three Multi-area mode Full HD D-Movie (1080p) video formats: FX, DX or the new 2.7x Crop mode—all at 16:9 aspect ratio. Manual exposure control helps keep the same look from start to finish. Built-in HDMI lets you view footage on an external monitor or record uncompressed 8-bit 4.2.2 footage directly to an external recording device. Even take 2MP stills simultaneously while filming. Attach the ME-1 Stereo Microphone and record high fidelity audio with minimal camera noise. On-screen audio level indicators and a headphone jack help you monitor and adjust audio in 20 incremental steps. D4 takes you from inspiring stills to amazing videos with ease. 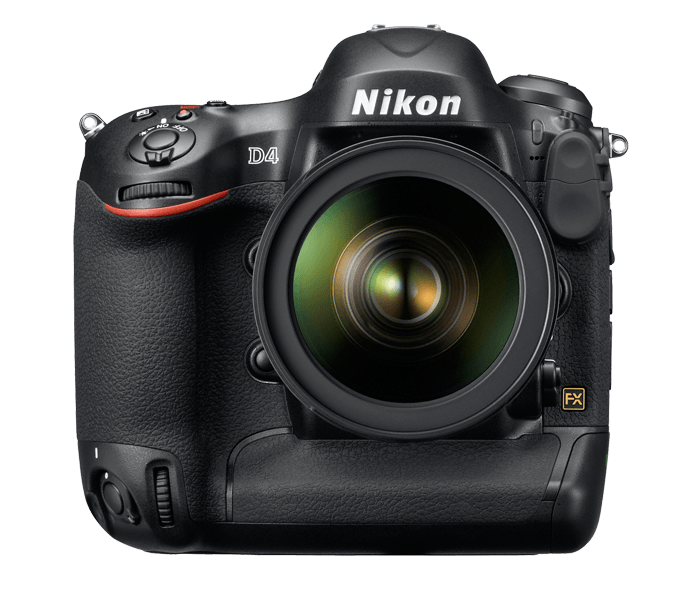 D4’s remarkable design is the culmination of photographer feedback and Nikon innovation. Adjust AF and AF Area modes without moving your eye from the viewfinder. Quickly select AF points with a new joystick style sub-selector—positioned for both horizontal and vertical shooting. In low-light, all operation buttons and dials are beautifully backlit. Two media card slots offer flexibility and control. Built-in wired LAN and the optional WT-5A Wireless Transmitter enable secure, high-speed file transmission as well as remote camera functionality. Simply put, D4 was built to meet professional demands. Draw on the full potential of D4: world-renowned NIKKOR lenses, the Nikon Creative Lighting System, Speedlights, accessories and software. Each impressive FX and DX lens in the NIKKOR lineup is fully tested to deliver sharpness, accuracy and reliability. Bring studio quality lighting to assignments with Nikon Speedlights. Only Nikon offers i-TTL (Intelligent Through The Lens) flash control, which allows Nikon Speedlights to access extensive exposure and metering data from D4 to provide unprecedented levels of flash precision and performance. Nikon’s professional imaging software, and a robust line of compatible accessories will help you expand your capabilities. When the world is waiting, being the first to publish makes all the difference. Nikon’s powerful new wireless transmitter, WT-5A, attaches directly to D4 to securely and quickly transfer files. HTTP Mode: Now you can use the web browser on your iPhone® and/or iPad®** to operate camera controls or begin Live View shooting, including starting and stopping HD video and more. Image Transmission Mode: Transmit images to an FTP server or computer two times faster than the Nikon WT-4A. PC Mode: Operate the D4 via Camera Control Pro 2. From one master camera, simultaneously release up to ten remote D4/WT-5A combinations. **iPhone® and iPad® are are registered trademarks of Apple Inc.
Nikon’s new advanced AF sensor uses 51 strategically placed AF points for faster focus operation by working together like a net to capture moving subjects or individually for pinpoint accuracy. Each of the 51 selectable AF points delivers fast and accurate AF detection to a low light level of -2 EV (ISO 100, 20° C) with every compatible AF NIKKOR lens. D4’s beautiful 3.2-inch, 921,000-dot LCD includes an ambient brightness sensor for maximum visibility and crisp playback, menu adjustment and Live View shooting. Quickly enlarge images and videos up to 46x for spot focus confirmation—crucial for high-resolution shooting. To sustain peak performance in the most demanding environments, D4’s body, exterior and mirror box are comprised of strong yet lightweight magnesium alloy. Thorough measures are taken to seal and protect against invasive moisture, dust and electromagnetic interference. Dual memory card slots (one CF and one XQD) Record two full cards of data, the same still image data on both cards for instant backup, RAW on one card and JPEG on the other or transfer data from one card to another. You can even designate one slot for data-heavy HD video recording. D4 aligns its 15 cross-type sensors in the center to detect contrast for both vertical and horizontal lines with lenses f/5.6 or faster. The five central points and three points to the left and right of them in the middle line are compatible with f/8. Check video recording on the camera’s LCD and external monitor simultaneously; ideal for focus pullers and camera operators. When the highest possible image quality is required, you can bypass memory cards and record uncompressed footage directly from the image sensor onto an external recording device. FX-format renders exquisitely shallow depth of field and wide-angle shooting. DX-format offers a 1.5x crop of the lens focal length, and 1920x1080 Crop format gives you a 2.7x angle of view—ideal for extending lens reach when you can’t get close enough. Set intervals and frame rates in order to dramatically relay slow-moving activity at dramatic speeds. D4 lets you shoot time-lapse photography with replay rates from 24 to 36,000 times faster than normal and save them as movie files. Face detection using the optical viewfinder and detailed scene analysis using the 91,000-pixel RGB sensor enables superior auto exposure, auto white balance, AF performance and i-TTL flash exposure. Photography Live View and Movie Live View modes add flexibility; exposure, white balance, monitor hue, histogram, focus mode, AF area mode and focusing accuracy are easily confirmed. Combine two exposures at up to 3EV to create a single image revealing an extremely wide dynamic range but with less noise and richer color gradation than ever before. Quickly access six preset picture control options—Standard, Neutral, Vivid, Monochrome, Landscape and Portrait—and up to nine customizable settings with a single button. Determine if the camera is level—horizontally or forward—through the viewfinder or LCD monitor. For the utmost reliability and rigorous performance, D4’s shutter has been tested on fully assembled cameras for 400,000 cycles at extreme continuous burst rates. Minimizes the bounce of the mirror’s down movement, extending viewing time and allowing more time for AF operation—one reason D4 achieves AF and focus tracking even during high-speed continuous shooting. Should any shutter variance be detected, D4 automatically corrects and adjusts between the actual shutter speed and correct shutter speed to sustain precision shutter operation throughout the mechanism’s lifespan. Expect greater operating efficiency thanks to a new, small, high-capacity EN-EL 18 rechargeable Li-ion battery that can deliver up to approximately 2,600 images* per charge. AF NIKKOR, including type G and D lenses (some restrictions apply to PC Micro-NIKKOR lenses) and DX lenses.